Actually we have so many we could probably go forever! James & Jai (17 months) — with Williamson’s Exotics. David & Aoife (6 months) — with SnugLove Babywearing. Kenny & Ezra (4 weeks) — with KarynandKenny Jack. Adrew & Maddi (16 months) — with Dana Chandler – mama bear and The Spinoff Parents. James & Josh (4 years) — with Williamson’s Exotics. Jared & Sabine (6 weeks) — with Jared Sail. Paul & Charlie (3.5 years) — with The Sling Consultancy. Paul & Mia (2 years) — with The Sling Consultancy. Charlie (3 years) — with The Sling Consultancy. “1. When I’m home from work and only have a few hours before bed time, I like to be able to be close to her without having to forsake the shopping and house work. 2. Since I don’t get much time with her during the week and the weekends are hectic, I don’t want to have to choose between spending time with her and being productive. 3. Sometimes when she’s really cracking it, I can calm her down, make sure she feels safe and can relax. James & Louie (6 months). — with Milka von Essen-Vilovski and Stephen McDowell. Paul & Charlie (3 years) & Jude (7 months) — with The Sling Consultancy. Paul & Jude (5 months) — with The Sling Consultancy. Brim & Raven (6 months) — with Brim Sorci and Samantha Sorci. Simon & Thomas (3 years) — with Mid Kent Babywearing and Zebadee’s Carriers. Neil & Abbie (2 years) — with CLOSER – babywearing consultancy. AJ & Ziggy (11 months) — with The Urban Good Life, Raising Ziggy and Soul. Simon & Thomas (3 years) — with Mid Kent Babywearing. Josh & Emma (2 years) — with Shelley Vanderbyl. Because our sons are watching and learning. Jake & Robbie (5 months) — with East Surrey Slings. AJ & Ziggy (12 months) — with The Urban Good Life and Raising Ziggy. Danny & Luna (2 years) & Semilla (8 months) — with Danny the Babywearing Dad. 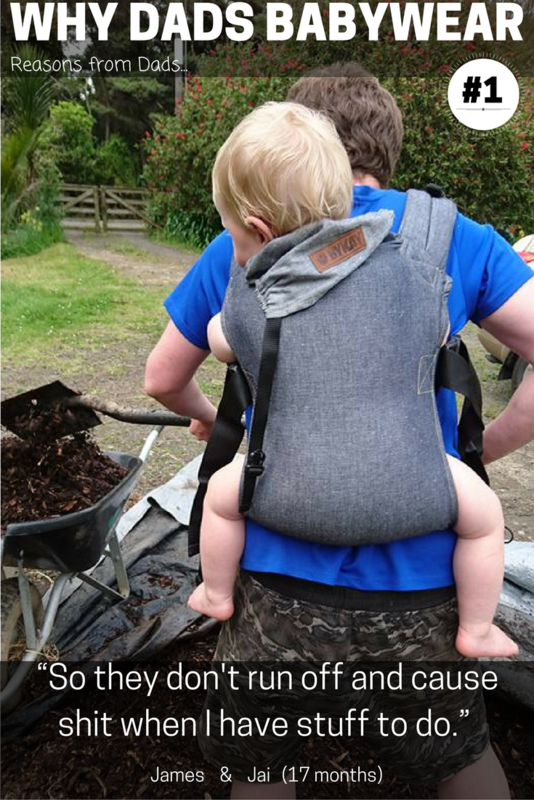 Dads from all over the world & here in little old NZ!